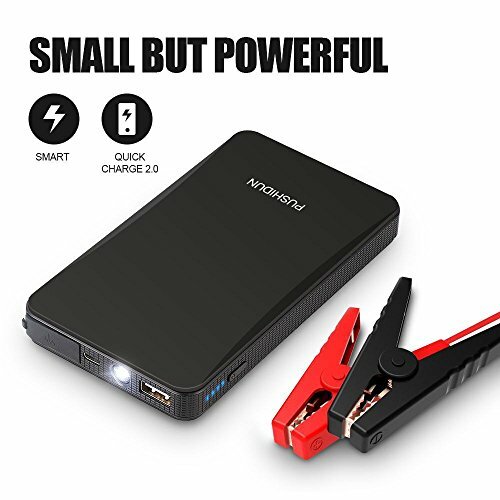 Portable Car Jump Starter Kit 6000mAh 400A Peak (Up to 2.5L Gas Car) Ultra-thin Mini Auto Battery Booster Jumper Emergency Power Pack with Smart Charging Port & LED Flashlight in 3 Modes. Jump start your car, portable power bank, emergency LED flashlight with 3 modes: flashlight, strobe and sos signal. Apply to mobile phones, electronic devices, digital cameras and other equipment charging, and it as small as Iphone 6s plus, easy to carry. The unit is supplied with a fabulous quality, Unlike traditional bulky jump starter packs, it's small enough to store in your glove box and light enough to pack in your bag. Don't jump start any engine that exceeds the maximum displacement the unit can bear, or it will cause serious damages to the unit. Your jump starter will perform best when its battery is fully charged. If less than 25% charged, it may not be able to start your engine. 【POWERFUL & COMPACT】: 400A peak current and 6000 mAh capacity, portable but powerful, jump start your vehicle in seconds (up to 2.5L Gas engines)，It also can start the car multiple times on a single fully charge. 【CIRCUIT PROTECTION】: Multi circuit protection modes， built-in intelligent circuit boards to provide overcharge, overdischarge, overcurrent, short circuit and other functions. 【ADDITIONAL FEATURES】: It can be used as a power bank with USB charging port, such as mobile phones, electronic devices, digital cameras and etc.. Ultra-thin mini body, just as small as Iphone 6s plus, easy to carry. 【LED FLASHLIGHT】：It comes a built-in flashlight with 3 modes (flashlight/strobe/SOS mode). It meets your lighting needs at night and in all kinds of emergency situations, providing security for your night-time travel. 【WARRANTY SUPPORT】: When you choose our PUSHIDUN car jump starter, you can enjoy up to 12 months of warranty coverage. If you have any questions, please feel free to contact, we will be here for you.